Bowl of popcorns, soda, crisps and pakodas, thick pillows and duvet and we are all set to watch one movie after another… Most of the Sundays are spent this way and last weekend we decided to roll back the time and go to 60’s and 70’s Bollywood movies. Boy, why don’t we have those kinds of movies with great storylines anymore!!! Watching them is like travelling through kaleidoscope of colours and reliving your colourful past. Every emotion is portrayed in a very subtle manner with generous doses of discreet symbolisms put in between. Just one look at the characters or the setting, you can easily decipher who they are and what is the situation. Through dress codes you can easily identify who is who. The hero of the movie is shown either wearing some colourful bell bottoms held with thick flashy buckled belt with matching shirt and driving a long, big car if he is from wealthy Khandan or spotted wearing simple kurtha-pyjama or simple shirt and trousers if he happened to be from poor/middle class family. Heroine is seen wearing colourful ‘decent’ frocks with matching high heels, sun glass and scarf if she is from wealthy family or draped in simple plain sarees with long hair when playing dutiful daughter. When it comes to the villain and vamp, they are always dressed in stripped t-shirt with a big mole or a scar on the cheek and figure hugging short dress with heavy make-up respectively. And then comes the most important roles next to these four characters, mother. She is always in kitchen cooking her son’s favourite Kheer or Besan ke Ladoos or Parathas and delivering standard dialogues with bucketful of tears! And then comes to the shooting locations. Romantic scenes? It’s usually hero following the heroine in bicycle or cars or dance sequence in disco with dome shaped wigs, or on snowy backdrop of Himalayas. Its common to see Hero and heroine dancing in the lush green garden and suddenly two flowers popping up and are shown brushing each other (those who are unfamiliar with Bolloywood movies, it means hero and heroine are indulging in physical romance). Fight sequence? Use dark and dingy go downs with gunny bags, huge glass partitions, drums, thick ropes, or market place with carts filled with tomatoes, mud pots, hills of colours, or use out door locations like edge of a cliff where hero is seen hanging like a hanging pot fighting with some dozens of bad guys and heroine screaming at top of her voice ‘Bachaoo’ (help!). Song sequence? It’s either hero or heroine playing piano or running around the trees. All said and done, movies of those days still grabs our attention with strong story lines and in spite of standard dialogues they still remain magical. Who can ever forget ever green songs like Tumne Muje Dekha, Neele Gagan Ke, Ehsaan Tera Hoga, Kora Kagaz Tha Yeh Man Mera, Mohe Panghat Pe, Yeh Shaam Mastani, Tere Ghar Ke Saamne, Tere Mere Sapne, Aaj Phir Jeene Ki Tamanna Hai, Yaadon Ki Baarat, Zindagi Kaisi Ye Paheli, Maine Tere Liye Hi, O Mere Sona Re, Tere Bina Zindagi Se Koi, Dil Dhoondta Hai Phir Wohi, Dil Kya Kare,..... The list is endless… these songs are still hummed, cherished and will always be my favourite. Yes, it’s true that “Old is Gold”. Similar to old movies and songs are some recipes. Dal remains to be my comfort food and this special dal is no exception. 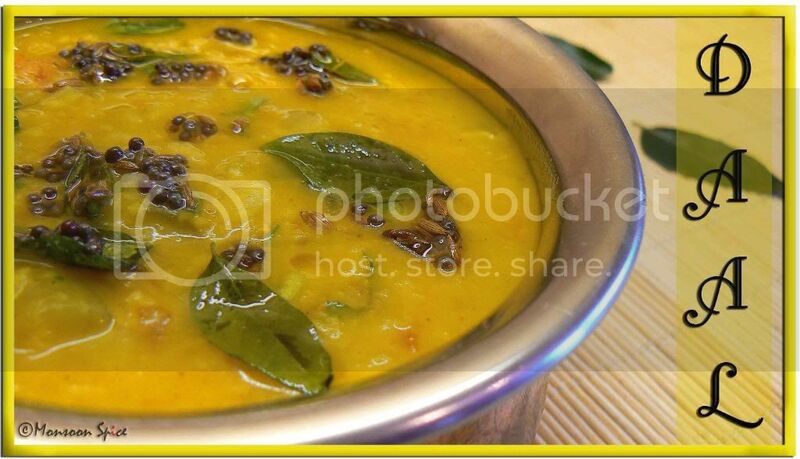 This classic my Amma’s recipe of Ridge Gourd Dal is one such ever-green one. Silky ridge gourd is cooked in creamy moong dal and coconut paste is full of flavours. Like vintage movies and songs, this dal gets better and better when cooked every time. And this goes to brave lady Barbara of Winos and Foodie's Taste of Yellow event supporting LiveSTRONG Day which is on 13th of May, 2008. "Please join me again as we remember those loved ones who are no longer with us, support those still fighting and celebrate with those who have won the fight." I couldn't participate last year due to time constraints and i almost forgot about it this year. Thanks to blog buddies I am back on track and sending my mother's recipe of Ridge Gourd Dal to her. Wash and cook Moong Dal with turmeric powder, ridge gourd cubes, onion and tomatoes and few drops of oil with enough water (about 2-2½ cups of water) in a pressure cooker for about 10-15 minutes/2 whistles till dal is cooked. Release the pressure from pressure cooker and let it cool before opening the lid. Meanwhile, grind coconut, green chilli, ginger and jeera to smooth paste by adding little water at time. Transfer this ground paste to cooked dal and mix well. Add salt to taste and let it simmer on low flame for about 5-10 minutes for all the flavours blend well. Add water to the dal if needed to get required consistency. Heat oil/ghee in a pan and add mustard seeds. When mustard starts to pop and splutter add jeera, hing and curry leave in that order and sauté. When jeera starts to sizzle, transfer the content into dal and mix well. Mix in chopped coriander leaves and serve this Ridge Gourd Dal with steaming bowl of Rice or Chapatti and enjoy. Some variations are, use Toor/Masoor Dal in place of Moong Dal and use coconut milk in place of grated coconut for different flavours. You can also replace ridge gourd with bottle gourd, ash gourd or any other gourds. Sia, the dal looks mouthwatering. 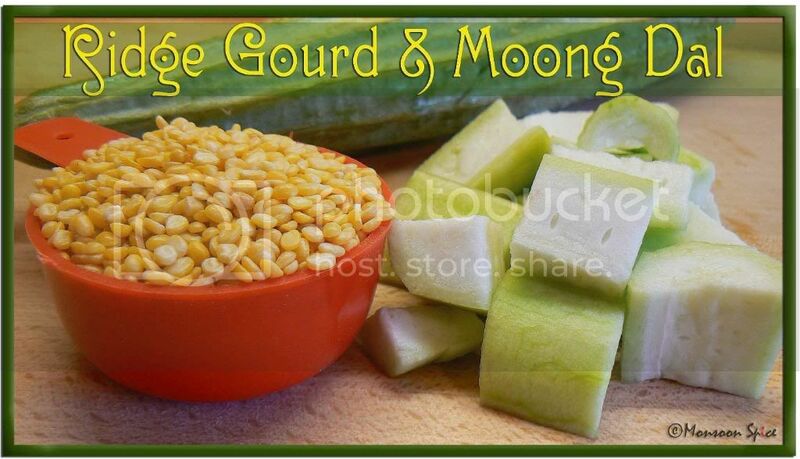 the pics are awesome as usual....moong dal and ridge gourd- quite an interesting combination.. Thank you, Thank you! My mom makes this with chana daal at home and I've never figured out the recipe. I'll use this with chana daal. Thank you again! Hey sia.. this is new recipe for me.. bookmarked it must be tasting really good right. Hey ninu sippeya chutney madtilleya? Ok, I thought you were giving a movie review....Sisila perhaps!!! :) Will mail you soon. Sia, I love all the songs too!! Old is gold!! This version of ridged gourd n dal is new to me and with coconut it really must be tasting divine!! You are so right dal recipes is classic and will never lose its evergreen status to speak in movie metaphor :) Ridge gourd tastes great in whatever dishes they get added to. This dish looks so delicious and comforting. I should make this when I start my Bollywood exploration, right? Thanks for visiting my blog Sia. This is my first time visit here. Wow! you have got a wonderful collection of recipes. Particularly I'm gonna try the scone and raspberry tart, because they are eggless. My nanamma used to make this recipe all the time. I just love it. this is one the most soul satisfying dishes i ever had! looks delicious as usual. Wonderful pictures. Your photos capture the stunning flavour of this nourishing combination of flavours. Sorry for not dropping by for a long time here Sia,..
that sounds great! have to try it. believe it or not, i love ridge gourd. Look at the colour of the dhal.. I've never tried cooking it with ridge-gourd but I've been meaning too. The seasoning on top looks so picture-perfect. Looks lovely! This will be sure tasting great with ghee and rice! I love all ingredients of this dal. 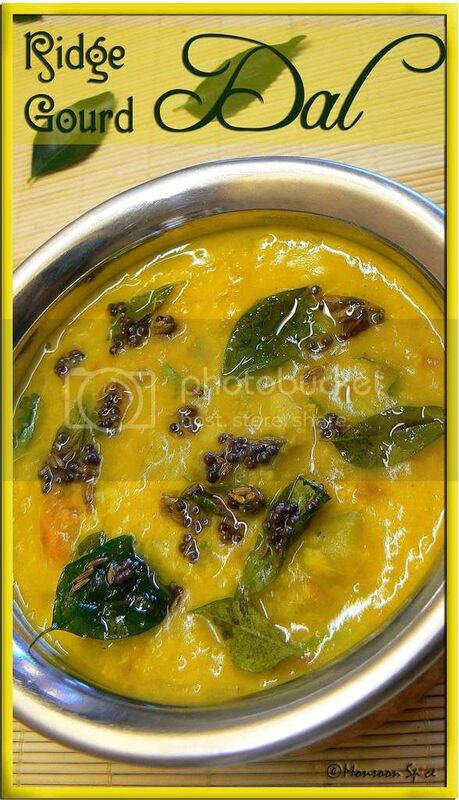 ridge gourd+mung dal +tomatoes....what else one need to make supreme taste. Hugs to you for sharing this lovely recipe. forgot to say , I just love love reading the first two para of this post, you are so right about the dressings of hero heroin and villain characters , brings smile to my face. Me and D both loves to watch old hindi movies, sometimes just for the simplicity of movie and their lifestyle(like movie- Bavarchi- is my all time fav. ) and sometimes for those predictable dialogs too :)).Its fun by all mean . And the last 4 song of that list is very very dear to me , thank for links :).Hugs to you , as you lastly voted there :D. check out the Awards...there is something for you too ,Sweetheart. HI hi i have bookmarked this post so i can listen to all that music in U.Tube. Love the dals dish with the veggies except i have never seen the veggie here. Hey and we are travelling to your side of the world. Leaving 2 London tommorow for four days. That first picture is lip-smacking. As for songs, I'm not able to get Rim Jhim Gire Sawan and Kabhi Tanhaiyon Mein Yun out of my head for the last one week! we also make this dal but without Coconut ..
and the songs u mentioned are my fav too ..
Sia, those pictures are so tempting- I have never cooked with ridge gourd before, so your dal is a must-try for me. Your description of those old movies made me laugh. Although I am not a huge Bollywood fan, I love old Hindi movie songs, and the ones you cited are all so beautiful. I could listen to them all day. Sups!! Who wouldn't love to hear those goldy oldy songs. Amazingly meaningful movies and meaningful songs!!! Just now came from Valli's and i see ridgegourd again!! yum yum!! Sia I love old Bollywood movies too. My husband just doesn't get them and thinks I'm a little crazy. Thank you so much for explaining the symbolism. I think I'd love to spend a Sunday at your house. Your dal looks wonderful. Thank you for supporting LiveSTRONG With A Taste Of Yellow.